Egbert Taylor, the UK-based waste management solutions company, has delivered the first Node recycling container system to the Czech Republic. 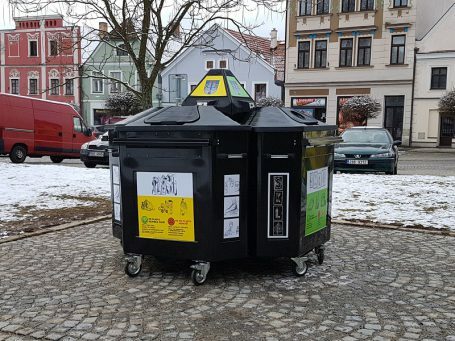 Recently, the Node recycling container system – which collects plastic, glass and paper waste – was installed in the city centre square of Kamenice nad Lipou, a city in the Vysočina region. The Node system replaced the old plastic containers, which had reached the end of their service life and took up too much space in the busy centre. Kamenice nad Lipou expects that in addition to the attention the new container will receive, there will be a corresponding overall improvement of waste recycling in the location. “We decided to install the Node recycling container system somewhere in the city centre, where there is heavy pedestrian traffic, many cars are parked and it is necessary to save as much space as possible. Instantly, we understood the advantages of the Node system, and so decided to install it on our main square. We believe that the residents will also like this new recycling unit and will get used to it soon,” says Mayor of Kamenice nad Lipou Ivan Pfauer. In addition, Kamenice nad Lipou received a spare 1100 litre Sellers container for storage of plastic. The Node recycling system, part of Egbert Taylor’s Urban Solutions range, takes up no more than two car parking spaces. Connecting four Node units offers a capacity of 3,200 litres, where each module can collect a different type of waste. “Thanks to its versatility, the Node recycling system is a favourite waste management solution. This smart recycling solution is very popular in the United Kingdom, where the Egbert Taylor bins come from. It is possible to fully individualize the recycling units and to choose the collected waste type for each unit,” says Tomáš Střelský, European General Manager of Egbert Taylor. “As a resident of Kamenice, I am very excited about this opportunity to install the Node recycling system in our city, as it is not only the first Node system to be installed in Kamenice, but also in the Czech Republic,” says Robert Fripp, Sales Manager of Egbert Taylor. As part of local involvement in the scheme, the stickers on the installed Node units have been illustrated by students from the local school, which has helped teach them about recycling matters and the environment, as well as drawing the attention of their family members and pedestrians to the new system.